Easy Eggs Benedict with Quick Hollandaise Sauce. I can poach an egg! It feels like the biggest accomplishment when you make a perfect poached egg. The secret is using vinegar in the poaching liquid, this helps to keep the egg together. This is one time that I cheat a little and use a package of Knorr Hollandaise Sauce. It's very good and if you add a little squeeze of fresh lemon into the sauce, nobody will know the difference. I had left over lobster from the night before and added some on top to make this dish extra special. Prepare Hollandaise sauce according to package and keep nice and warm, string occasionally. In a small skillet, over low heat, cook Canadian bacon 2 to 3 minutes per side. In a large skillet, bring water and white vinegar to a low boil. If using a non-stick pan, 1 inch of water is fine or use 3 inches of water if you are not using a non-stick so that the eggs don't stick to the bottom of the pan. Crack eggs one at a time and gently drop each into boiling water. Cook 4 to 5 minutes, or until eggs are firm on the outside. Place toasted English muffin halves on a platter and top each half with a slice of Canadian bacon. Then, using a slotted spoon, place an egg over each slice of bacon. 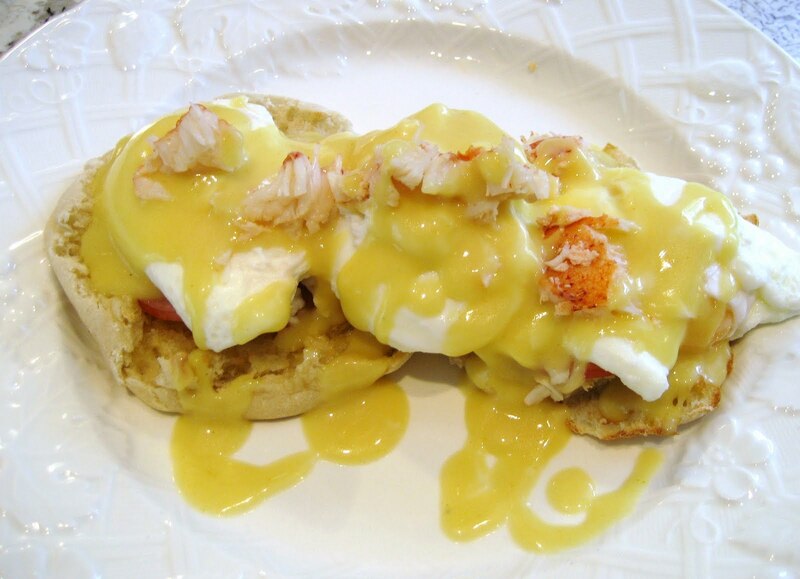 Top eggs with warm Hollandaise sauce and top with lobster if you desire. Tip: If making a large batch of poached eggs, use an extra egg as a "test" egg. I like my eggs very runny. Looks very good. I can't wait to try my own. I like them with canadian bacon. Most restaurants use Knorrs as well so don't feel bad. To make it healthier try this...instead of an English muffin use a slice of tomato and instead of bacon use grilled chicken(left over from night before is fine)I also like to garnish with asparagus. Its a very low carb high protein meal to start the day.